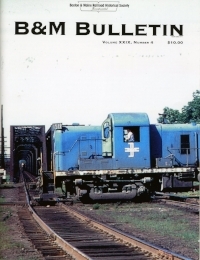 Our flagship publication is the B&M Bulletin whose first issue appeared in 1971. Since then the Bulletin has evolved from stapled sheets of photocopies to a professional-looking, glossy magazine. The “White Flags” section leads off each issue and summarizes recent developments in B&M territory with lively editorial comment. 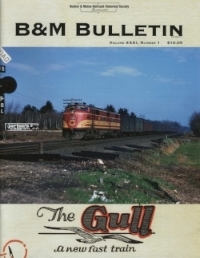 This is followed by a variety of articles representing the best research available on B&M topics interspersed with outstanding photographs by such celebrated B&M photographers as Dana D. Goodwin. The articles themselves are sometimes biographical, sometimes covering certain locations or equipment, always reflecting the wide range of interests of our readers. 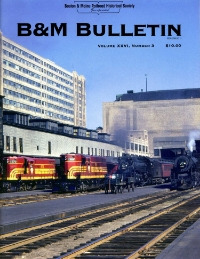 Many back issues of the B&M Bulletin are available for purchase. See our Merchandise flyer for details. 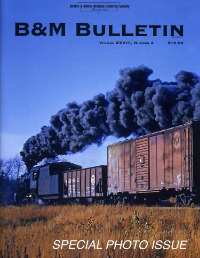 Read a sample article about the B&M in Manchester, N.H.
Diesel locomotive acquisition. GP9s to Utah. Draw 1 replacement plans. Track changes Downeaster route. A New Day for B&M Motive Power, Western Route Bottlenecks, Positive Train Control on the MBTA, Green Line Medford Extension, MBTA locomotives, Possible Expanded Conn. River Passenger Service. What to Do About Keolis? Pan Am winter derailments, C40-8s, Trains Idling in Andover, Springfield Union Station revival. Consists from the Car Books of Conductor Forrest E. Staples. The Conn River: Colorful Railroading-2. The B&M's Future: Short Line empire, or Class I? CSX C40-8 locos acquired; Poland Springs water by rail; Positive Train Control; Wick Moorman at Amtrak; Conn River Line; Photos: Commuter Improvements. Consists from the Car Books of Conductor Douglas M. Rice. The Conn River: Colorful Railroading. Why Do Transit Projects Take So Long? MBTA Improvements; Freight Recession; Pan Am (MEC) Nos. 3400-3404; Vin Bernard, Lester Stephenson, Jr., Robert McDonald, Buddy Winiarz obits. White Flags: Back Yards, New MBTA Locos. Keolis takes over. Where Have All the Bridges Gone? White Flags: Crisis at the T? Pan Am Leases GP40s. Grain Trains. White Flags: One Railroad or Two?